Meal replacement shakes are a great way to reduce your calorie consumption by replacing a meal that would normally be 600 calories or more with a simple 100-110 calorie shake. It's delicious on its own and also makes a great base for smoothies while still keeping your meal under 300 calories! In addition to providing a great source of protein and essential nutrients, IdealShake harnesses the power of a special ingredient: Slendesta, a potato protein extract that controls appetite and cravings for up to three hours. Enjoy a shake for breakfast, for lunch, after a workout, or when you want to enjoy something sweet! The Thermo Oxidation Blend plus Neuro Energy Blend contained in IdealBurn harness the double benefits of green tea and caffeine. The caffeine in IdealBurn is an aid to both focus and attention as well as endurance and fat oxidation (the breakdown of fatty acids). Green tea is a natural source of caffeine and is rich with catechins, which can also support fat oxidation. 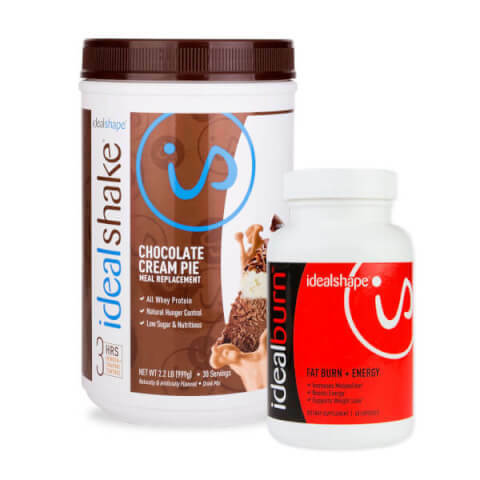 The idealshakes are absolutely delicious and paired with the burn they are a great weight loss tool.